Rundeck makes enterprise operations run better. Manage automation from legacy to cloud services. Leverage any scripting languages or tools you want to use. Reduce ticket queues. Improve response times. Validate compliance. Log all Ops activity. It’s easy to roll out your first Rundeck project. by defining a single step or a workflow that can execute any set of commands, scripts, or tools on any number of local or remote nodes. Jobs can be triggered by the scheduler or on-demand via the web interface or API. to execute or follow the output -- depending on the permissions you give them. Collaborate with others and build your organization's library of repeatable and auditable actions. You can also let users to run ad-hoc commands (if your security policies allow it). You've safely given Dev and QA teams access to self-service operations tasks (restarts, health checks, deployment, data management, etc). Now you can spend less of your time fielding repetitive requests and more of your time doing new and interesting things that will further the business. Jobs are how you define a workflow of actions and can be triggered by the built-in scheduler or triggered on-demand by users or other tools. A Job is comprised of workflow steps that execute scripts, commands, plugins, or other jobs. At runtime, jobs can take options or files as input. Other Job features: configurable workflow execution strategies (parallel, sequential, conditionals, etc. ), built-in error handling, notifications when a Job succeeds or fails (email, webhook, or custom plugin), organize Jobs with Job Groups, schedule Jobs using cron syntax. Nodes are any remote physical (servers, network devices, etc.) or logical (VM, service accounts, containers, etc.) endpoints. You can create static or dynamic lists of nodes on which your workflow will execute. Node data can be pulled from anywhere, including Chef, Puppet, Amazon EC2, OpenStack, Docker, VMware, in-house CMDBs, or even monitoring tools. Nodes can be organized using tags or other customizable attributes. Projects are a way organize your jobs. In addition to keeping things organized, access control policies, logging, and import/export can be managed at the project level. Rundeck gives you multiple user-friendly ways to watch your jobs execute in real time. There is a summary view, node-oriented view, workflow view, and collated log view. With Rundeck’s access controls, you can give other technical or non-technical colleagues visibility into activity as it happens. Rundeck lets you audit and search all previous Job and command executions. See exactly who ran what, when it was run, and in what context it ran (nodes, options, etc.). Fine-grain access control capabilities allow you to specify who can do what and to what resources. You can also specify what different roles will see when they login. Integrate with your company’s Active Directory or LDAP server for easy management of user authentication. Rundeck provides you with an audit trail for management or compliance uses. Rundeck provides a built-in keystore for managing sensitive data like passwords, encryption keys, and other secrets. The keystore enables users to securely supply a job with credentials or secrets without having to expose that sensitive data to users. Plugins are a way to add new functionality to various parts of Rundeck. The most common type of plugins, step plugins, let you quickly turn your existing scripts and commands into repeatable pieces of automation. Node executor plugins let you fully control how to access and execute actions on remote nodes. Option provider plugins let you define how you want to get data from external sources. Other plugin types include logging, notifications, SCM integration, workflow engine, and more! You have the option of managing your jobs as text files stored in Git. Rundeck will handle the import from and export to your Git repo. The Rundeck UI will tell you if you are out of sync with the repo. 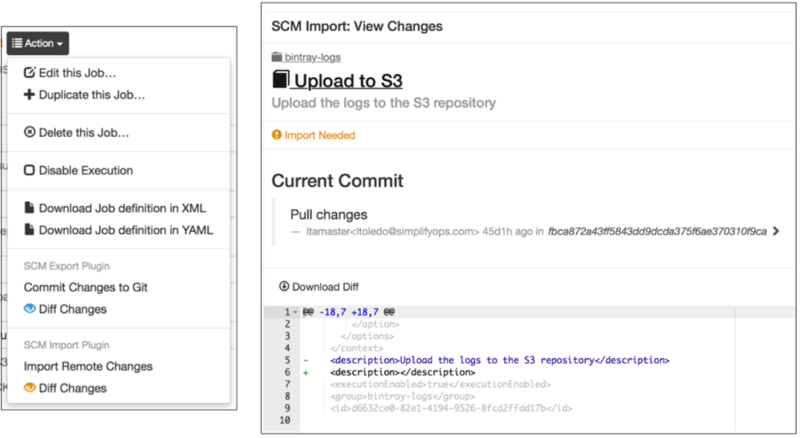 Git integration works right out of the box, but the SCM integration is a plugin point and can be extended for other SCM systems. Rundeck exposes a fully-functional web API (REST) that provides the full functionality that is available through the Rundeck UI. The API is an easy way to call Rundeck jobs from other tools, scripts, and services. 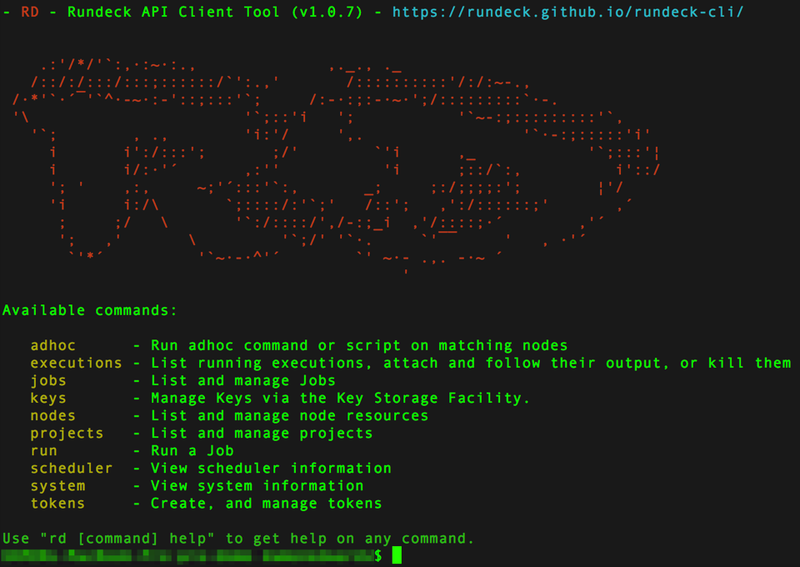 Rundeck also comes with RD, a CLI tool that wraps the web API and provides a first-class command line experience.